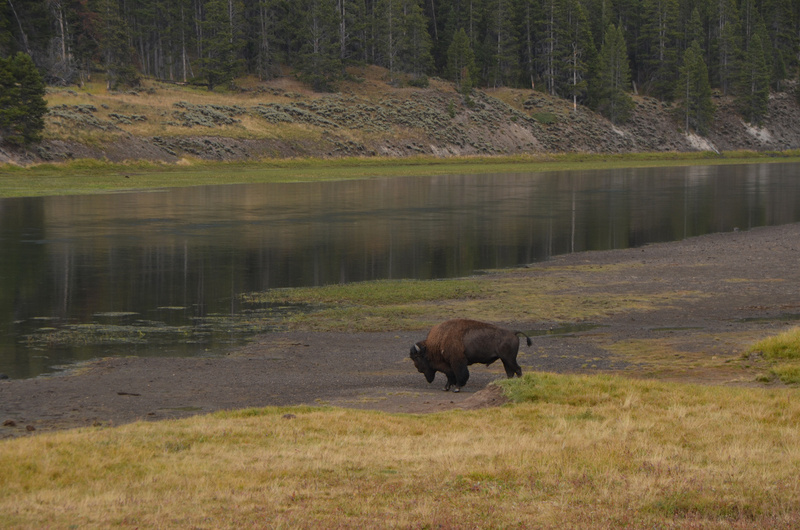 August 24-30, 2015 – Yellowstone – This is Yellowstone post number four, “Bison”. The American Bison, or as we used to say “Buffalo” is the big guy on the plains. The first one you see you will take a lot of photos, but two things I can guarantee, you will see another, and I can’t imagine that you could spend a day in the park and not see, well, “a lot” of bison. In one case I had been waiting near the front of one such bison jam, for about five minutes. 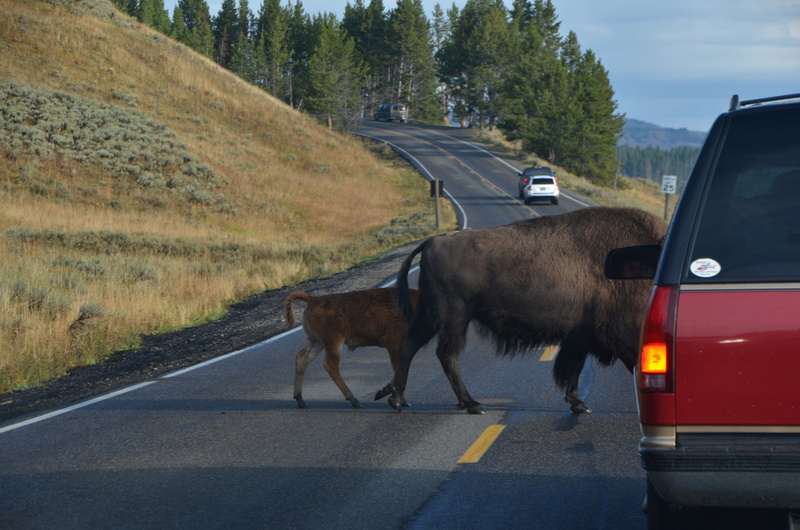 The bison were pretty much just standing in the road, a lot of them. When finally, a ranger arrived in a truck, drove around the oncoming traffic (wrong side of road) and came through using the button on his truck’s public address system to make loud clicky static. This had the desired effect of stirring them to action without making them panic. But sometimes the herd mentality takes over and they start to pick up the pace, then one starts to trot and they all do. Now one decides to maybe turn between the cars, before he can decide it isn’t really where he wants to go the one beside him gets the idea too. Now they are bumping into one another and turning and snorting. Well, they are definitely unpredictable. 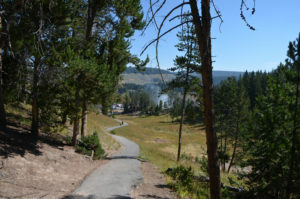 At mud volcano I took a walk up the trail to see the Black Dragon’s Caldron. I’ve seen a lot of change at this area over the years of my visits and I really wanted to check in this time as well. As I headed up the trail people coming down seemed to be pretty quiet. One person stopped and told me that there were Bison up top and that a ranger was keeping people from continuing on. I decided to continue my walk up, talk to the ranger, and see what I could. 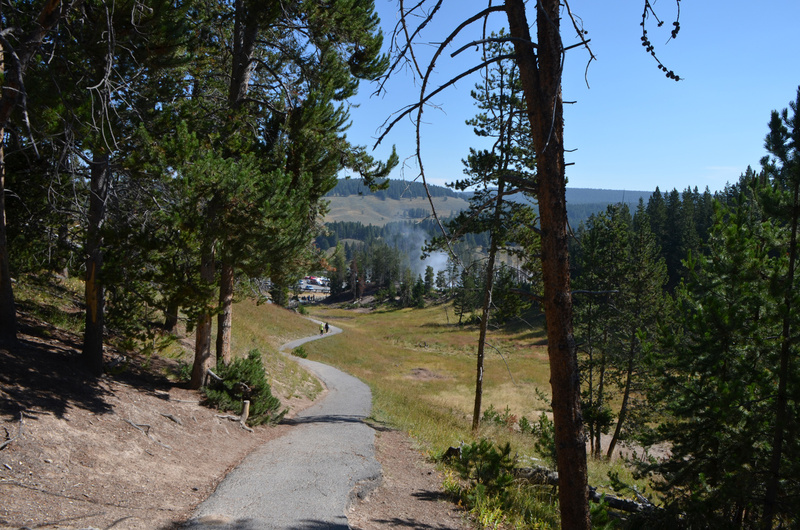 As the trail leveled off and started into the trees I saw the ranger far off standing on the board walk with some people gathered around, but closer another group of people stopped and watching something. It was then I heard the thunder. Not a storm but five 1500-2000 male bison came running through the forest at about 25 miles per hour, across the trail from right to left down the slight slope to disappear into a depression. I was happy not to have been closer. The people who were closer to me were now backing up away from the thundering bison. 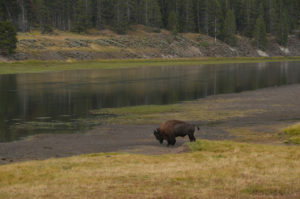 After the bison had passed the ranger escorted the folks my way and I wandered a bit further to meet the group. I listened as the ranger talked to the gathered folks and he explained that the bison had settled into “sizzling basin” just ahead, and were pretty much blocking the rest of the trail. From here we could get a bit of a view of the herd, so I took a few pictures and headed back. No worries, the thunder had been enough bison for the day. 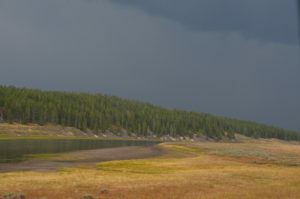 An important part of the Yellowstone experience is the unpredictable weather you get from being at eight thousand feet above sea level. 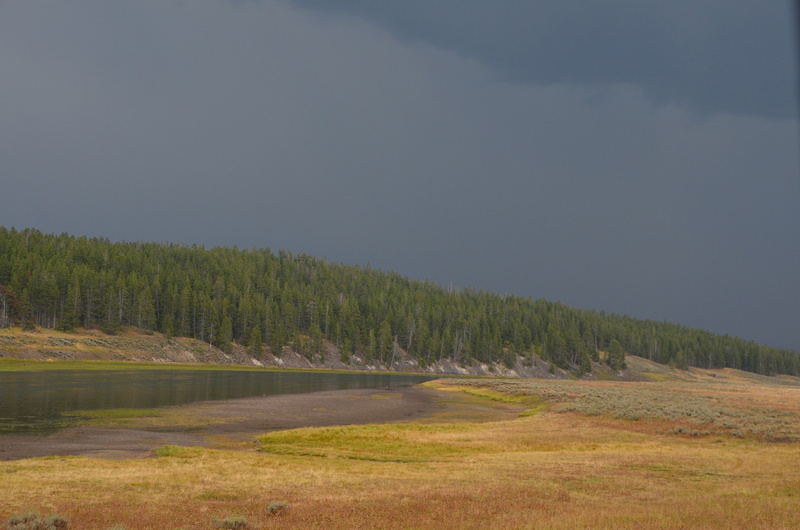 While I was visiting the “Grand Canyon of the Yellowstone” quite a thunderstorm was building to the south. After getting a quick shower and back to the car and dried off, I decided to drive a bit south into the Hayden valley to watch it closer. I pulled off at the end of a turnout near the river facing the “wrong way” along the left side of the road, so there was a lot of turnout ahead of me and it would be easy to get back on the road, yet lots of room for someone else to pull in going the right way. But there were no other cars here because there wasn’t really anything to look at unless you were watching the stormy sky. I had my window down looking through binoculars, it was between rain showers. My attention was drawn to some diving birds that were in the middle of the river. Long necks, lighter color, not white, maybe some brown on the sides of the head/face. I watched them for a while, but that’s about all I could tell. So, I decided I should overcome the momentum of just sitting in the car and get out and walk down the bank to the river side. With my new found determination and a goal in mind I set down the binoculars and looked up through the windshield to see the oncoming traffic stopped a few car lengths down the road. 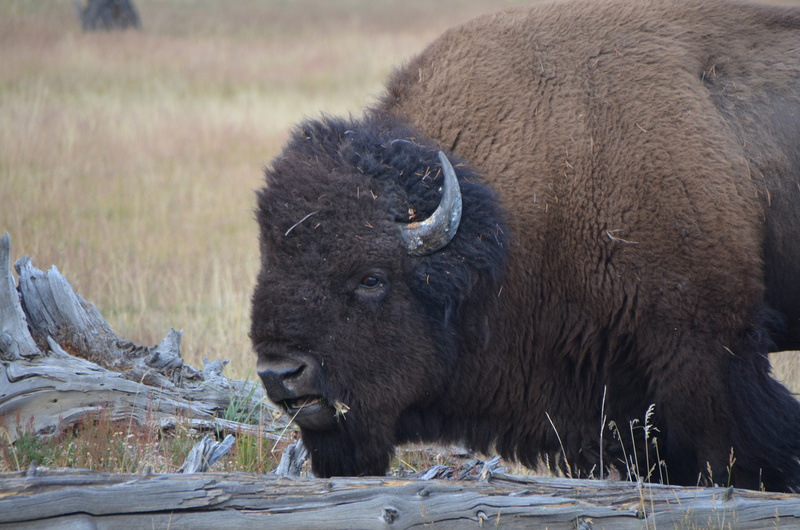 Curious about why they had stopped, I turned a bit further to see a huge male bison brush past the front bumper of my car and right down the path I was about to take to the side of the river. 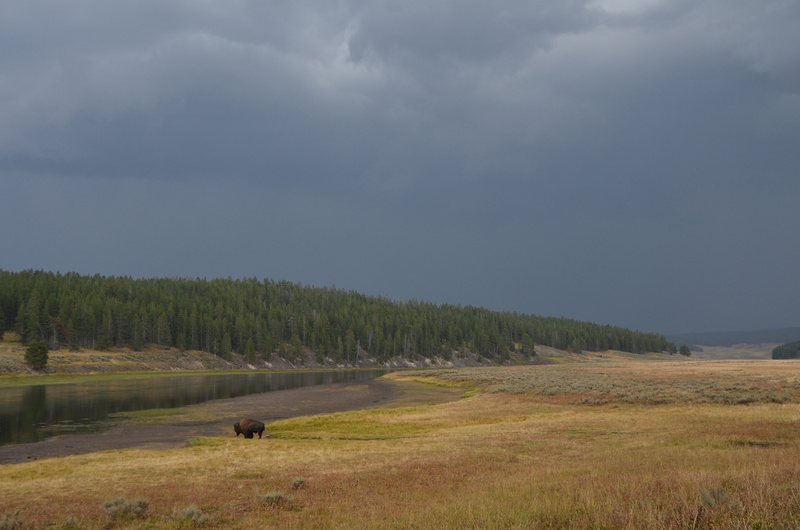 So I opted to stay in the car after all, and take pictures of the bison with the dramatic sky behind him, and what those birds were I will only be able to guess. To finish with the dramatic weather story, I heard from other people who were actually in the storm that they got a quarter inch of hail. Not only did I see their photos, but when I got back to my trailer many hours later there were small pockets of hail stones left over here and there. The one eye staring and the grass hanging out of his mouth. This one seemed to be daring the tourists to object to the herd’s presence. Ranger using his truck’s public address to make just enough clicking and static that the herd decides to trot on down the open lane. You stop for one crossing the road and then several wander up alongside. Hayden valley from the road. This is a typical view here. 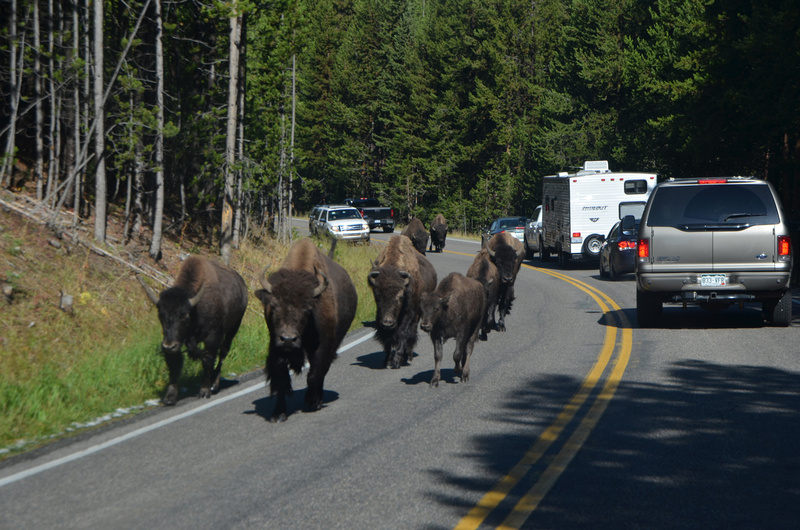 All along the road out to the Northeast entrance, herd upon herd of bison. 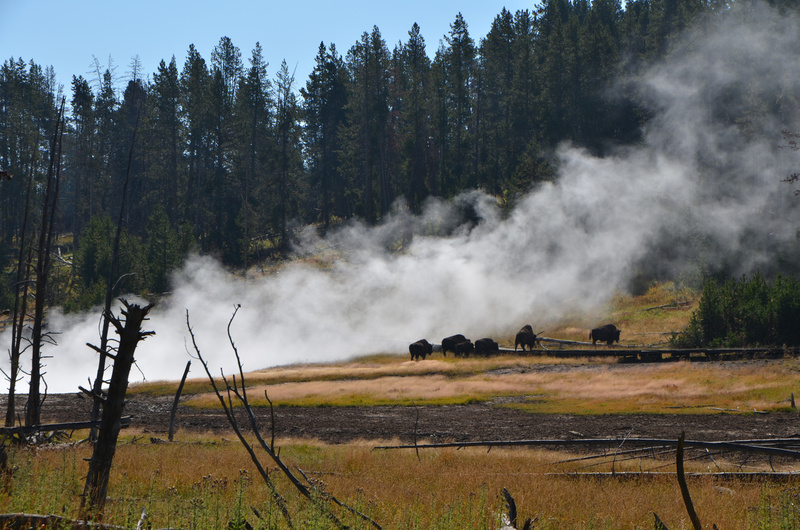 Bison in the Lower Geyser Basin on the west side of the park. Climbed up this to see what I could see. 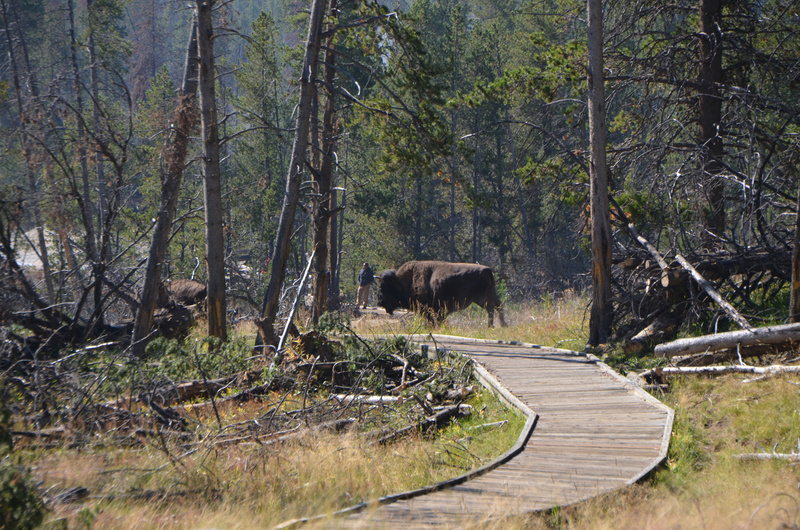 Click through these three images to get an idea of the bison rushing through the forest. Here’s where they had settled, around and on the boardwalk. Sizzling Basin, hope the bison don’t end up sizzling. This lone bull was lounging about twenty feet from a little spur road I drove down. I was able to take portraits of him from the car window. What is with the straws sticking out of their mouths? This bison walked right in front of my car and down the path I was going to walk towards the river, just as I put down my binoculars and reached down to grab the latch.